Running on the roads can become very boring and running on a treadmill can be even worse. Trail running though will allow you to run outdoors and take in some beautiful scenery. In order to cope with the more challenging terrain, getting the best trail running shoes is crucial. Getting the best trail runners, however, can be difficult due to the number of different features that are important to what makes a great shoe. You want to make sure that they have the right durability and traction but also want them to be light and comfortable. Here we will explain those features, why they are important and how they affect each other. We have also completed trail running shoes reviews on the best products available. Once you’ve read through this, you’ll have all the knowledge you need in order to choose the perfect shoes for you. 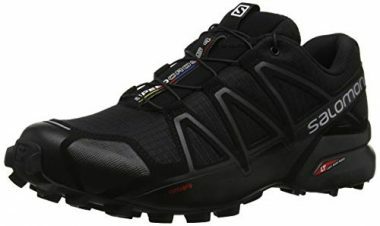 Salomon have produced one of the top rated trail runners which has a long list of great reviews from those who have used them. The shoes look great too and come in a variety of different colors to give you the style you’re looking for to make you look great when you are out there on the trail. These trail shoes are made from textile and synthetic in order to give you the qualities that you need from a trail running shoe. The rubber sole will be able to give you a penetrating level of traction while you are running and will enable you to have a precise foothold in order to have a comfortable feel. A great feature of this shoe is that it has one pull tightening of the laces which means that you will easily be able to take them on and foot your feet. The EVA midsoles will be able to give you a high level of cushioning and stability, and overall this is a brilliant shoe which gives you all the key features of a great trail running shoe. 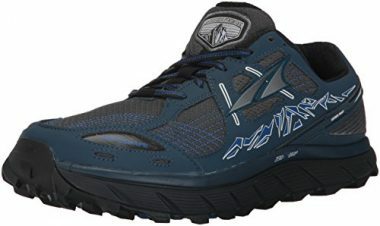 This is a great product from Altra which is one of the best mountain running shoes on the market. They will give you a comfortable fit when your feet are in the shoe by giving you a natural foot position and a toe splay which is going to ensure that you can run without having any pain. It has a dual layer EVA midsole which is going to give your feet the right amount of cushioning so that your feet don’t get sore and it will also be easier on your joints too. The outsole of the shoe is made from high-quality rubber which will ensure that you stay upright when you’re out there. The upper has a lot of mesh which will allow a lot of air to pass into your shoe to make it breathable but it is also very quick drying too. The shoe also gives you a high level of protection to stop any stones from getting into your shoe and there is also a large toe cap in order to prevent any painful injuries. New Balance have long been a huge name in the running shoe world and you can see why when they make quality products such as this one. As well as the mesh that is seen on all of these trail running shoes, the upper also has leather which is going to be able to give the shoe a higher level of durability. Throughout the shoe there is a good mix of EVA and PU which will be able to make sure that it is comfortable and able to absorb shocks but it also adds to the durability too. To go with the features which make it quality footwear, it is also highly stylish and comes in a wide range of colors. The shoe will be able to give you a great level of feel while you are out there as these light shoes will help you run on that looser ground while still having a solid base. This is a shoe which is going to be able to be very durable but doesn’t sacrifice anything when it comes to stability and comfort. 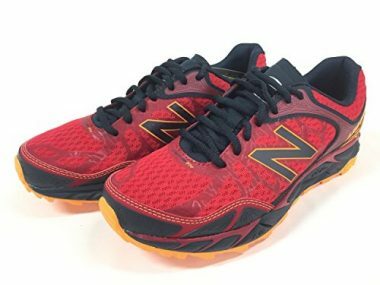 This is another of New Balance’s lightweight trail running shoes which is going to be able to give you a great balance of all the key features. It’s made from synthetic material which helps the shoe be as light as possible and allows it to be highly breathable, even in hot conditions. It features a large rubber sole which is going to be able to give you all the grip that you need, even when to conditions become a bit more slippery. It has a high level of toe protection to make sure that you are going to be protected should you stumble into a root or a rock. The shoe doesn’t feature any sewing and therefore it reduces any chance of any rubbing happening with your feet and also helps it to last for longer as you don’t have any worries about the seams coming apart. This is a highly comfortable shoe which is going to be able to give you a high level of protection. One of the features that hiking boots have which is absent on almost all running shoes is a high amount of ankle protection. As trail running shoes have to be very light this is often not featured but this is one running shoe which is able to give you that extra protection, which is great for anyone who has ankles which are a bit more vulnerable. The zero drop fit of the shoe will allow you to have a natural alignment within the shoe which will lead to a low impact when you hit the ground. When you make that impact, it will give you even more comfort as your feet will be spread out naturally whether you are on an ascent or a descent. The outsole is made from rubber which will give you a high level of durability but importantly also a high level of grip too. This is a great shoe for those who are worried about sustaining injury when you are trail running as it will be able to give you a much higher level of protection than most other shoes. In a complete contrast to the previous product, this is a shoe which doesn’t have a lot of support in the ankle but does have many features which make it a great trail running shoe. The obvious huge advantage is that these shoes are very light to make them extremely easy to run in. Due to that low profile, the shoe has a high amount of durability in all areas with material which are the highest quality including a midsole which is going to be able to give you long-lasting support and an upper which is going to be durable but also highly breathable too. Another part which is the highest of quality is the sole as it is made from Vibram rubber which is extremely well-made to give you the perfect balance of traction and durability. If you’re looking for a trail running shoes which has the feel of a regular running shoe, then this could be the perfect product for you. 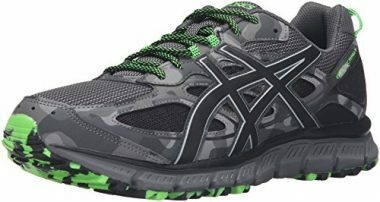 This is another very highly rated shoe, this time from Asics which will be able to give you an all-around performance. The shoe is synthetic which will be very light when you are picking up your feet and it is also very breathable too and will help to keep you comfortable at all times. 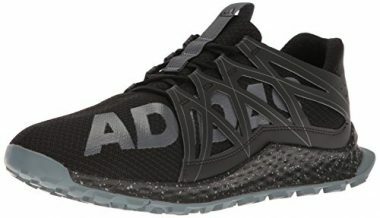 The shoe has rear foot gel cushioning which will be able to absorb a lot of shocks when you are running and also able to transition your foot through your stance. It has a high traction rubber sole which features lugs to give you a high level of grip whether you are running downhill or uphill. It also features a removable sockliner which will allow you to have a medical orthotic fitted if you need one. There are a few great designs of the shoe which look great and overall this is a high-quality shoe which is going to be able to give you the right level of comfort and support. Adidas are experts when it comes to making performance shoes but are more commonly associated with sports sneakers and standard running shoes. They have used their expertise though to create trail running sneakers which are one of the best on the market and one which will give you a lot of comfort. The shoe is very light which will help you to run for longer and prevent your muscles getting sore. Despite that light weight, the shoe also offers you a lot of durability and it will be able to last you for a long time. Adidas produce shoes with a very high degree of quality and that is no different with this shoe. The upper is made mostly from a breathable mesh which will allow a lot of air circulation and allow your feet to breathe too. There are also protective overlays though which will ensure that the shoe remains stable and is able to offer you the right amount of support. 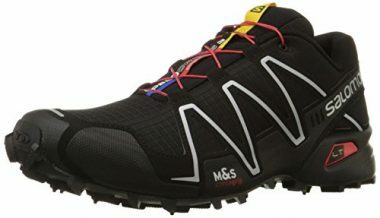 Salomon are a company who have one feature which is unique from many others and that is the shoes ability to tie the laces extremely quickly with their quicklace system, which lets you tighten or loosen them extremely quickly. This is especially useful after a long run when you are exhausted. The shoe has a water-resistant upper which will be able to give you a good level of protection when it is raining and it will also help to prevent any debris from coming into your shoe as well. There is a protective rubber cap on the end of the shoe to ensure that you stay injury free. There are other great features which make this a comfortable shoe too such as the dual density EVA midsole and the ortholite insole. The outsole will be able to give you a large amount of grip, even in the mud and snow, and it is non-marking too for when you’re inside. This is another great shoe from New Balance and another one which looks great with its distinctive design and high level of performance. It’s made of fabric and synthetic materials which help to make the shoe very light and ensure any sweat from your feet can be evaporated away. The upper is able to fit tight to your shoe and help to give you a high level of support when you’re running. That support is added too by the rubber sole which is going to give you a very high level of traction and make sure that you stay on your feet at all times. The shoe offers plenty of toe protection and has an EVA midsole which is going to help to absorb all of the impacts which happen when you are running. This is a great product which has been highly rated by those who have used it so you can be confident that you’re getting a great running shoe. 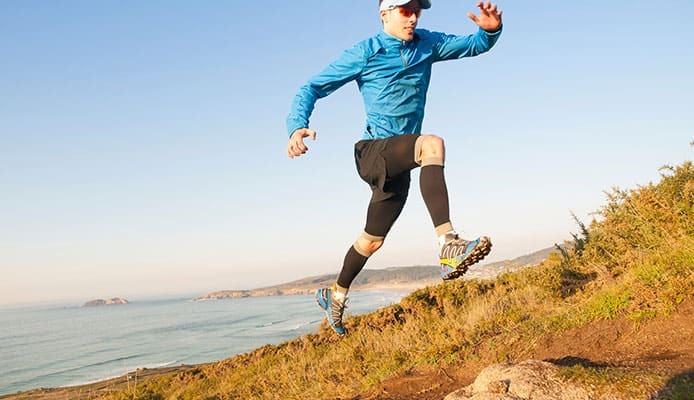 There are a few requirements that you need when having a trail running shoe as opposed to a regular running shoe and one of those is that amount of protection that they are able to give you. On more difficult terrain you need to be able to not only have that comfort that you need from a regular shoe but also have protection from the harsher conditions. One area which you need protection in is with the toe area and you will see that all trail running shoes will have extra rubber in this area to help with any impact. The reason for this is that you are much more likely to stumble into any stones or roots when you are out there running. If you fit these with your full force and you didn’t have any protection then you could well break your bones. Having protection around the toe will help to act as a barrier to that and will prevent a serious injury from happening. A lot of companies have different designs in this area as some will try and save weight but having less rubber. If you’re more prone to falls then it would be a good idea to get more protection in that area. The ankle is an area which will receive a lot of protection from hiking boots where the chance of turning over on your ankle is vastly increased. This isn’t an area which is usually added on hiking shoes and trail running shoes due to the additional weight that is can have. There are some running shoes though which have this feature though which is useful for those runners who plan on doing a more extreme level of trail running. Another area where it’s important to have a high level of protection and that is with the part of the shoe which actually hits the ground, the sole. The sole has a few key roles which makes it probably the most important part of the shoe. It needs to be flexible enough to give you a high level of traction but not too soft and it also has to be highly durable to last for a long time but also to prevent any sharp rocks or branches from penetrating the role. When it comes to the upper, this is where different shoes off a different level of protection. A mesh-dominant upper will be very light but won’t be able to give you much of a barrier from the outside of the shoes. Most of these shoes have a synthetic material that partly covers the shoe in order to give you more protection but the most durable running shoes will have leather on them, which will give you a lot more protection. There are certain aspects here that come down to a balance that is made between durability and weight. If you are only going to be running on simple and light trails then you will need less protection but if you’re on tougher terrain and more technical trails then you would most likely need some extra protection. One of and perhaps the biggest reason that you’re looking into buying a trail running shoe is because of the weight. Running in hiking boots would be impractical, running in hiking shoes would still be too heavy and regular running shoes give you very little protection. 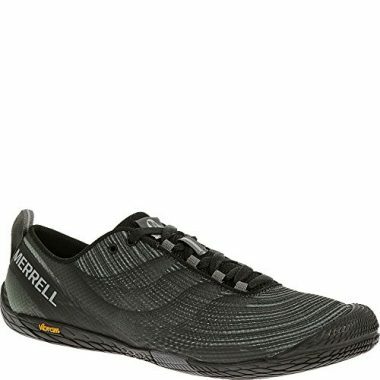 These trail running shoes act as a middle ground between hiking shoes and regular running shoes. If a trail running shoe isn’t light then there is no point in buying one as the whole point is to have that extra protection but having it while still having a shoe which is going to be able to feel fast and allow you to run for a long period. The weight of the shoe though does play a delicate balance between all the other key features that you need. Due to that, just picking the lightest shoe most likely isn’t going to be the best idea as it might not match the situation that you are going to be in. As we mentioned there, the protection that your shoe has will play a huge role in the weight. In simple terms, the more protection, the heavier the weight. Aspects like extra padding, a larger sole, a toe cap and leather upper will add weight. Durability and protection also have a very close relationship as the more durable your shoes are, the more it will weigh. That’s due to the fact that in order to make a durable shoe, more material needs to be added which is part of the compromise that you need to have. Having a very light shoe on technical and difficult terrain will not only be more dangerous but it will quickly wear out your shoe too. While it may feel like somewhat of a contradiction, there is also a delicate balance between comfort and weight too. On a trail there is more chance of you running uphill and downhill which requires a few key features, the lugs on the sole need to be able to be large enough to cope with the changes in direction and also the shoe needs to have specific padding in the front and back in order to deal with the ascents and descents. As you can see, even though the weight is a crucial aspect of why you want a running shoe, it should be treated in relation to the type of activity that you will be doing and what your needs are. It’s the best idea to settle on the type of running that you will be doing, how much protection, durability and comfort that you need and then after that you can compare weights of the shoe. There are quite a few different factors that can affect durability which is an important part of any product. There is no point in having the lightest and most comfortable shoe ever made if it’s just going to fall apart after five minutes. You need to make sure that you are buying a quality product which is going to last. This, of course, is very hard to test on the first use of the product as the true durability of the product can only be determined after months and possibly years of use. One great way to check this is to see the user reviews of the product and see what people are saying who have used the shoe for a very long time. That way you will have a much better idea of how well the shoe is made. Of course, there are certain brands who have long developed a reputation for making high-quality footwear. All the brands that we have reviewed here are well-known for their quality and you can trust them to deliver you a quality product which is going to last. From the outset though, you can see which type of materials are used and see if they are of the highest quality or a little bit cheaper. As we have already seen though, sacrifices need to be made and sometimes companies will deliberately sacrifice a little bit of durability so that it can excel in other areas. Rubber is one material which can have a vast range of quality depending on who made it. The rubber on cheap shoes is vastly inferior to the rubber on more expensive shoes. For a trail running shoe this is vitally important as you need to make sure that it doesn’t wear away quickly but will be able to give you the traction and protection that you need. EVA is another product which can be very different in quality depending on how it is made which is why you see many products described as dual-density when it comes to the midsole. EVA needs to be soft enough to give you shock absorption but not too soft that it starts to wear away and become compressed. TPU is another material that is found in the midsole which is lighter but will able to give a large amount of support with a great degree of durability. The upper though is probably the one area on the shoe where you can see that largest difference in durability and this usually has to do with the use that you are going to have for the shoe. Hiking boots are mostly leather, hiking shoes are partly leather and trail running shoes usually have no leather. The reason for that is that leather is a heavy material and is therefore sacrificed in footwear which doesn’t need to have the same level of durability. As you can imagine, a trail running shoe doesn’t need to have the same level of durability as a hiking boot but some running shoes will contain leather or also harder synthetic material in order to give you that added durability. This usually depends on your own specific need. Even though durability can depend on other key features, you also want to make sure you are getting a shoe which is very well made. Before you decide to buy a trail running shoe, you need to know the use that you are going to have for it. Running on a technical trail which has difficult terrain with a very light shoe and very little protection isn’t going to be able to give you what you need and would be too dangerous, but the same shoe on a light trail could be the perfect solution for you. Light trails – If you are going to be out there on easy trails which aren’t very technically difficult then all you would need is a shoe which has very similar qualities to a regular running shoe. There are still plenty of reasons though why using a regular running shoe wouldn’t be suitable in these situations due to the specific features in a trail running shoe. Even on lighter trails you will most likely be running over much looser ground which is why you would need a much higher level of traction than most running shoes. The improved rubber and larger lugs will be able to cope with the terrain. You also need increase stability too as your feet will be changing direction and angles a lot more than on a road. Then there is obviously the increased level of protection that you can have from a trail running shoe with that protection coming from the underfoot and the toe especially when compared to a regular running shoe. Due to the lighter trails though, you wouldn’t need the same level as if you were going on more challenging runs. Versatile shoes – It could be that you don’t want to limit yourself to one specific type of trail running and will want to some days take easier trails and other days take more challenging ones. If this matches your intended use then it is a good idea to get a trail running shoe which is able to have a few more added features but a shoe which is still going to be very light. When you look at the market, the majority of the shoes that are on offer will fall into this category as most people want to be able to have a great balance and have the best of both worlds. These types are will often have a higher level of stability to help you run over uneven ground without losing your balance and tripping over. Those areas that separate this type from footwear from regular running shoes will also be strengthened such as the underfoot and the toe. They will also generally have more padding throughout the shoe and be a little stiffer in the midsole and the upper in order to add to the support that is required on more challenging terrain. If you’re not going to be on very rugged terrain often then it’s probably the best to get one of these shoes which work as a great all-rounder. They are still very light and comfortable but will give you that extra protection and durability that you are looking for. Rugged terrain – For some people though, they want to be able to head out on more extreme trails and head away from the common path and enjoy nature in its raw beauty. This is a much greater challenge for your footwear and therefore you need to have a shoe which is able to cope and there are some great options out there. One of the biggest requirements for such a shoe is the high degree of traction that they need and therefore these shoes need to be made from the highest quality of rubber and also have large lugs on the bottom of the shoe to be able to deal with even looser ground. These lugs also need to be able to deal with movement in all different directions too. Another aspect which they will often have which others don’t is ankle support. When you are on more rugged terrain there is obviously a much higher risk of your turning over on your ankle and having ankle support would be able to help minimize any potential injury. The added stability of these shoes is also another important aspect of keeping you upright. Added to these features the shoes also need to have a higher level of durability, they need to be stiffer and able to give your feet even more support. 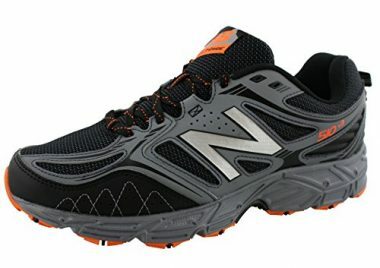 These types of shoe resemble hiking shoe but try to offer the same amount of protection while still being light enough to be comfortable enough to use as a running shoe. Traction on these shoes can be one of the hardest aspects to analyze when it comes to the type of rubber which is used. As we mentioned before, rubber is made differently by different manufacturers and therefore the quality can be different from one shoe to the next. There are also stickier rubbers and ones that are a lot softer. Companies often outsource the making of their soles to different companies which specialize in the making of rubber and Vibram are one company who are known to be leading experts in then this industry. If you see a product which has this type of sole then you know that it is going to be of the highest quality but there are other brands who also produce high-quality rubber. On more difficult terrain, a balance has to be struck as the rubber has to be durable but also soft enough so that it can grip into the surface but hard enough that it will allow you to push off too. They also have to be sticky enough so that you don’t slip on surfaces such as rock but not too sticky that it gets stuck. It’s clearly a fine balance which is why spending that bit extra on a quality shoe is important. The traction of your shoe doesn’t just depend on the rubber that is on the bottom of them, of course, but also the lugs that are on the sole. Lugs are the name for the individual pieces of rubber which are on the bottom of your shoe which aim to work like the tread in a car tire, making their way through the debris so that you can puff off solid ground. The more challenging terrain you are heading over, the more important it is to have larger lugs which are able to deal with a dynamic range of movement. Running with large lugs on roads is going to feel a little strange which is why it’s important to get the right shoe for you. In the looser ground they need to be tall and also spaced in different directions to come with the more agile way that you will be running but also running up and down too. Traction is an important aspect of any running shoe. You want to have the highest quality rubber regardless of what type of terrain that you are running on. The size of the lugs though is dependent on the terrain. Just like with a car tire, no tread gives you high speed but little grip, a lot of tread gives lower speeds but more grip. You just need to find the right balance for you. There are many aspects here where we are talking about the increased level of protection, durability and traction etc. that you need when you are getting a trail running shoe and while all those are going to be very important, you still want to have a very comfortable shoe which is going to make you enjoy the experience of running time and time again. The amount of cushioning that is provided will vary quite differently from one company to the next and this can often depend on the amount of feel that the runner wants with the ground beneath them. The level of cushioning directly under the feet is known as the stack height which is the distance from the foot to the ground. This can often depend on the personal preference and how much feel you want. With shoes that will be on more difficult terrain, it’s likely that you would want less height as this would give you more control of your footing and less chance of rolling over on your foot. This will give you less cushioning but will most likely be easier to run in. Having a higher stack will give you more comfort but less control. The thicker midsole will be able to absorb more impacts and your feet will probably be less sore at the end of the day. As with a lot of these features, most of the shoes find a common ground with a balance between the feel of a smaller shoe and the comfort of a larger one. The comfort of the shoe can also depend on the heel-to-toe drop of the shoe too. This is a hotly debated topic between some runners when it comes to which style is going to be the most comfortable and which style will cause the least injury. The heel-to-toe drop is simple how much higher the front of the shoe is from the back. The common preference is for a moderate drop of between 4-8mm which will be able to place your feet in a comfortable position and will allow for a mid to back shoe handing. Some people though prefer a zero drop (a flat shoe) which will give a mid to front shoe landing where other runners want a more dramatic drop of 8mm and above in order to have a heel landing. This is a personal choice but the safe option is to get a shoe with a small drop. The stability of your shoe is more or less its ability to keep you upright and on your feet. Most shoes don’t really have to worry much about stability as you will be walking in straight lines on flat surfaces but when you are out there in the great outdoors, then you need a shoe which helps to combat the uneven ground that you are going to be running on. The first part of this is having a solid base which will give your foot a wide enough area to be resistant to rolling. This base can’t be too wide though as that would start to impact other aspects such as your ability to turn. The shoe also needs to be firm enough so that you are able to push off from a solid base and also so that it doesn’t fold over then to is placed against something uneven. One feature which is seen on a few shoes but not all, as a shank which will run between the midsole and the outsole. Often this is only placed in the back half of the shoe as it will be able to give you an added level of stability as the increased stiffness will help to keep the back of your shoe solid but allow the front of your shoe to be more flexible. When you are running and changing angles, then the hide of your foot and your heel is going to be pressing against the sides of your shoe in different positions. It’s important therefore that the more challenging terrain that you are running over, the more support your shoe is going to be able to give you to prevent this. The shoe needs to be strong enough to keep the bottom of your foot pressed against the insole. As with a lot of these aspects, the amount of stability that you need will largely depend on the type of terrain that you are going to be running over. On flat, easy ground not a lot of stability would be needed but on the more challenging ground a higher level of support would be required and therefore it’s important to bear this in mind before buying your shoe. There are some running which will look at the pouring rain and decide to stay indoors and there are others who will not be fazed by a little bit of rain. Waterproofing of running shoes can be a nice additional feature but it also needs to be considered in the context in the activity that you are doing and the amount of time that you will be in the shoe. 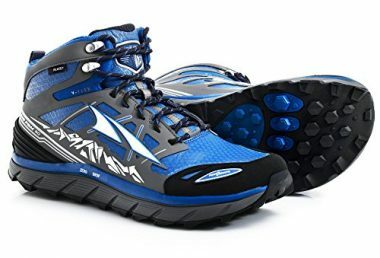 These shoes generally have a low ankle which will be exposed to the rain and if you are running through wet ground then it’s highly likely that some moisture is going to get in from the top even if the shoes have a waterproof material on them. Also it’s unlikely that you will outdoors for as long as someone ho id hiking, for example, so even if your feet got wet you wouldn’t be exposed for long. Leather is a material which will give you a natural level of waterproofing but not a lot trail running shoes will have this material on them and instead can have a lining which is added to the material. A lining such as Gore-Tex is a very popular choice as this does add a waterproof layer but does so while still being breathable. Any waterproofing that a shoe has though is going to add some weight to it. Due to the fact that water will likely get into the shoe and also that you won’t be out for a long time, a lot of people would prefer to not have that additional weight added to the shoe. The waterproofing will help to keep your feet dry though when it’s raining which can help to prevent sore feet and also help to prevent you from getting blisters. This waterproofing can be especially important in colder weather and snow were you also want to be able to keep your feet as warm as possible, if you’re looking for a shoe which is going to be able to give you protection all year round then it could be a good idea to get waterproofing. In the summer though, it might be that you would prefer to get a shoe which is going to be able to dry very quickly so that they will never be wet for long. A vital part of a trail running shoe is for it to be breathable. By that it means that a shoe needs to be able to let air circulate through it in order to cool it down and also to let any sweat that comes off your shoe evaporate into the atmosphere and this can have a large impact on your levels of comfort and enjoyment. If your feet start to sweat and there is nowhere for the air vapor to go then it will soon make your shoe very uncomfortable as you will be running in wet socks. This can not only simply feel horrible but it also greatly increases the chances of your getting blisters as it will soften the skin and create more friction within the shoe. In terms of making a shoe breathable this comes down to what material will be used on the upper. A nylon mesh is often used as that will be able to let the air pass through while being very light. In order to maintain structure and stability this is usually mixed in with other materials such as harder synthetic materials or leather in order to form a solid enough upper. Having a shoe that is highly breathable though will most likely influence different features of the shoe, especially with durability, protection and waterproofing. Most shoes have a nice balance between more durable structures and mesh to give you the breathability while still having a tough and durable shoe. The need for a breathable shoe will depend on the climate that you are going to be running in. In colder climates you should put more focus on waterproofing and durability as your feet won’t be sweating as much but if you are running in the summer then it’s highly likely that you would need a very breathable shoe in order to prevent you from running in wet socks. With any form of footwear when you are going to be on a trail, it’s important to have protection and pretty much all trail running shoes have this feature. There is a reason for that and it’s vitally important as it will prevent serious injury. Without it you could well turn a minor stumble into something like a broken toe which will put you out of action. All shoes need to come with toe protection then but the amount that they have will differ from one tree to the next. One of the reasons for this is that they are usually made out of hard rubber and that rubber will add extra weight to the shoe which is not ideal when it comes to a running shoe which you want to be as light as possible. This level of protection generally increases with the intended use of the shoe. In shoes that are designed for light trails there won’t be much protection available but with shoes that are designed with more difficult terrain there tends to be more overall protection on the shoe, including at the toe. The need for this also depends on what type of person you are. There are some people who are naturally more accident prone and therefore would probably want a higher level of protection and there are those who are a bit more sure-footed and can be able to run confidently without having as much fear of tripping over and stubbing their toe. The underfoot can also have extra protection which can be good for those who will be doing many miles on difficult terrain. This will help to give you protection from rocks and other debris by having a plate which will sit between the outsole and the midsole. As with toe protection, this will be more prominent on shoes which are designed for more rugged terrain as the plate will add a little bit more weight to the shoe. The size, length and thickness of the plate though will depend from one shoe to the next. Sometimes this will be made from firm foam and other times it could be made from other materials such as a nylon shank. This will add to the stiffness of the shoe but it will give you that extra layer of protection for runners who love the more extreme trails. On light trail shoes, this protection often won’t be there as the sole will still be able to give a good level of protection. Q: What Is The Difference Between A Trail Running Shoes And Regular Running Shoes? A: Trail running shoes and regular running shoes have to be able to deal with two very different road surfaces. Regular running shoes will be perfect for anyone who is running on straight lines on hard and flat surfaces such as a road. Trail running shoes on the other hand will be running over a variety of different surfaces, with more twists and turns and often with a lot less grip. That means that trail running shoes need to have a lot more traction in order to deal with the increased demands that will be placed on the sole. There will also be a lot more protection to as there will be added material on the toe and the underfoot has to be able to protect you from sharp rocks and other debris which can be found on a trail. Due to the higher level of abrasion from other the surfaces and other material which can come into contact with the shoe, they are also made to be more durable so that they are able to deal with the larger amount of stress that is placed against them. They also need a higher level of stability too in order to cope with the uneven surfaces that you will be running on. One area which regular running shoes do have an advantage is with their weight. Due to these extra features that a trail running shoe needs, they aren’t going to be as light as a regular running shoe but will still be more than light enough to enable you to have a comfortable run when you are outdoors. The weight of trail shoes is still going to be significantly less than hiking shoes though which makes them perfect for running on that even ground. Due to these high levels of differences, it’s important that you get the right shoe for the activity that you are going to be doing. Using regular running shoes on a difficult trail won’t be able to give you the protection that you need and you would leave yourself very vulnerable to getting very sore feet and more seriously having an accident. Q: How Do I Clean My Trail Running Shoes? A: When it comes to the care required for trail running shoes, one of the first things that you need to do is to inspect them for any stones or debris that has been stuck between the lugs. Not only can this impact on your comfort but it will prevent the shoe from having its full level of traction but also it can act as an abrasive and quickly wear away the sole. After this, it’s important to clean the shoe the best you can using warm water and a mild soap if required. It’s never a good idea to soak the shoe as this could damage it in the long run and should only be done if absolutely necessary. Each shoe will have its own care instructions on them depending on the different materials that they are made from. It’s always very important to follow these instructions closely otherwise you will risk damaging the shoe or weakening it too. While these shoes are very well made, you don’t want to risk ruining them by cleaning them incorrectly. Q: Are Trail Running Shoes Waterproof? A: Trail running shoes aim to be as light as possible and in order to be so, a lot of shoes will decide to not have any waterproofing which can add a significant amount of weight. Due to this most trail running shoes won’t have a lot of waterproof protection except for the large outsoles that they have. There are options out there though which will have a water resistant membrane which would be more ideal for those who would be running for a prolonged time in difficult conditions. For most people though, waterproofing would not be required due to the other factors. Breathability is very important in a running shoe and a heavy amount of waterproofing out inhibit this. If it did, your socks would soon get wet due to the sweat coming from your foot and therefore having the waterproofing would be useless. Having a shoe that is heavily breathable will also let it dry very quickly too. 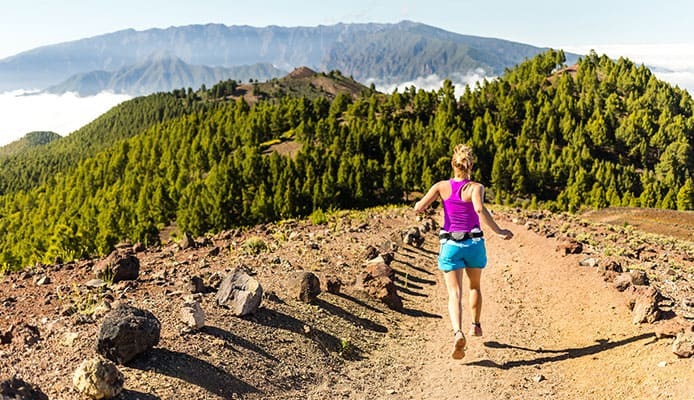 Trail running shoes let you get out into nature and enjoy the experience of running on those trails with more confidence and protection than you would get from a running shoe. They aim to take the qualities that you have from a hiking shoe and a running shoe to combine them and make footwear that allows you to run over more difficult ground. In order to achieve that there are a lot of features that it has which need to excel while making sure that it is not too heavy. Weight is going to be a crucial factor and all of these products are going to be light and comfortable but some weigh less than others. A large reason for that is that some shoes offer more protection and are more suitable for technical trails. 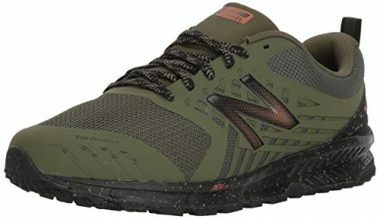 The durability and protection that these shoes offer will be a lot more than would be found on a running shoe but will vary from one trail running shoe to the next depending on the use that they will have, some are designed to be worn on lighter trails and some are designed for more technical trails and you need to know what type you will be looking for. Traction is one area though which all shoes need to excel in due to the added difficulty of running on trails. You want to make sure that they are made from high-quality rubber and that the lugs on the bottom of the shoe match the activity that you are doing. Taller lugs are better for more difficult conditions when you need a higher level of grip. The cushioning is important too and another area which can differ between one shoe and the next, and often comes down to personal preference. Some simply prefer as much cushioning as possible whereas others will want a closer feel to the ground and a higher level of agility. Breathability is vital to have in a running shoe, especially if you are in warmer conditions as otherwise your feet will sweat very quickly and your socks will become wet. A high amount of breathability will help you to keep cool but sometimes you will sacrifice some in order to have a more stable, durable and waterproof shoes. Once you are able to see which key features are important to you, then you would be able to find the perfect trail running shoe for you depending on your specific needs. Hopefully this guide has given you all the information you need in order to choose the perfect shoe for you and have a more enjoyable run than ever before.